Almo Nature - Cat - HFC 70 Cuisine is delicious cat food made with ingredients that were originally suitable for human consumption. This cat food contains tuna, chicken and ham or cheese. These tasty ingredients ensure your cat can enjoy this delicious meal. 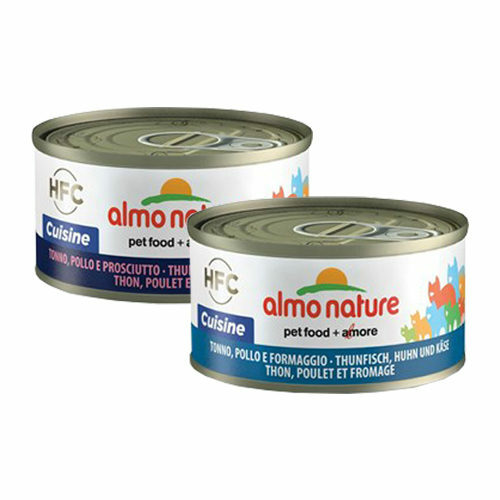 Almo Nature - Cat - HFC 70 Cuisine is delicious high-quality cat food. This wet food is made with ingredients that were originally suitable for human consumption. This food contains a limited number of ingredients, so you know exactly what you are giving your cat. The ingredients have also been cooked in a broth or au bain marie. Your cat will certainly love this delicious meal. Tuna, Chicken and Cheese: tuna 35%, chicken 35%, fish stock 24%, cheese 5%, rice 1%. Tuna, Chicken and Ham: tuna 35%, chicken 35%, fish stock 24%, ham 5%, rice 1%. Have you used Almo Nature - Cat - HFC 70 Cuisine before? Let us know what you think about this product.